EADS CASA Espacio – Astrium – is the Spanish world leader in space activities. Its most important activities are the development and manufacturing of launcher equipment. It supplies: for Ariane 5, payload adapters, the 3936 cone adapters, the vehicle equipment bay, interstage structure and Vulcain engine piping; for Vega, the AVUM liquid propulsion stage structure, payload adapters and VESPA multiple launch system; and for Soyuz at the CSG, payload adapters and the ASAP multiple launch system. With an aeronautical tradition going back more than a century, the City of Seville and its industrial firms came to the natural conclusion that their links with all aspects of space should be strengthened. Airbus Military and other high-tech and aerospace firms work on the European Ariane programme. ArianeGroup, which is a world leader in solid propulsion for space launchers, manufactures the nozzles and sees to the propellant casting, assembly and delivery of the Ariane 5 boosters and to the first stage of the Vega launcher. It offers a full range of services and products covering launcher needs, from design to manufacturing, up to recycling at end of life. Bremen is the European centre of excellence for human spaceflight, launcher vehicles and space robotics. ArianeGroup Bremen develops and integrates the complete upper stage of Ariane 5, which is capable of inject payloads into orbit with a level of precision unrivalled anywhere in the world. This site shared with Airbus Defence & Space has been also responsible for key European contributions to the International Space Station (ISS), such as the manufacturing of the Columbus Space Laboratory and the Automated Transfer Vehicle (ATV). Lampoldshausen is the historic site for space propulsion testing in Germany. With the support of the DLR and ArianeGroup, all European space propulsion systems are tested there which relies on its unique in-vacuum condition facilities across Europe. Its test bench facilities are also capable of welcoming high thrust engine such as Ariane 5’s Vulcain 2 cryogenic engine for hot firing tests. ArianeGroup engineers in Lampoldshausen are also in charge of developing, assembling and testing the hypergolic propulsion engines and thrusters used for launchers upper stages and in-orbit satellite propulsion. Les Mureaux is the heart of European launcher systems development and integration. This is there where the first stage of Ariane 5 has been developed and is now manufactured. It is capable of carrying 150 tons of cryogenic propellant and burning it to boost the launcher upper stage and its payload into space. Besides manufacturing the Ariane 5 first stage, the design offices based in Les Mureaux are responsible for designing the space launch vehicles, spacecraft such as the Automated Transfer Vehicle (ATV) and other space equipment for satellites. The new Ariane 6 launch vehicle is currently developed in Les Mureaux and its first stage will be assembled and integrated there in a near future. ArianeGroup core activities in Ottobrunn encompass launch vehicle propulsion systems, including the thrust chambers – the very heart of any rocket engine – for the first and second stages of Ariane 5. The firm is also responsible for manufacturing propulsion sub-systems for telecommunications, navigation and Earth observation satellites. Drawing on more than 60 years of experience of rocket propulsion, ArianeGroup designs, develops and produces entire liquid propulsion systems for launchers. It is the prime for cryogenic propulsion for Ariane 5s, notably for production of the Vulcain 2 and HM7B engines, as well as for cryogenic propulsion development of the new upper stage for Ariane 6 with the Vinci engine. 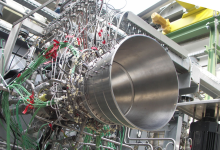 ArianeGroup is further developing a new generation of low cost and multi-ignition semi-cryogenic engine called Prometheus. Involved in European space transportation since 1979, Avio produces Ariane 5’s two lateral solid-propellant boosters and the liquid-oxygen turbopumps for its Vulcain engine in collaboration with Herakles. ELV – a subsidiary of Avio and of the Italian Space Agency (ASI) – is the prime contractor for the development of Vega and responsible for the launch system design. For 40 years, the Clemessy Group has been acive from design to integration, from development to maintenance, in space systems, deploying its ground segment competences: assembler of command/control systems; automisation of test benches; verification of satellite and ground support electrical equipment; power distribution; securing of assets and persons; voicedate- image communication. This grouping of firms aims to draw attention to the importance of space exploration and of the Ariane programme and their technological, economic and social impact on Europe. It includes Astrium, DLR Lampoldshausen, the Heilbronn University of Applied Sciences and various local and regional entities. GTD has been playing a major role regarding the family of European launchers for 15 years. The firm is involved in providing: the ground launch systems at the Guiana Space Centre for Ariane, Vega and Soyuz; measurement and safety control equipment common to all three launchers; and Ariane and Vega onboard software. MT Aerospace – an OHB company – has been a European space programme partner for over 40 years. The firm supplies about 10% of Ariane 5 hardware, is involved in the development of Ariane 5 ME, and – through its subsidiary MT Aerospace Guyane – plays a part in developing and building the launch facilities at Kourou. The firm is also heavily involved in other space projects, ranging from the ATV to Alphasat, and in studies on future projects. Ruag produces the payload fairings for Ariane 5 and Vega. Its fairings have been used for some 220 European and US launches. The firm is also a world leader for payload adapters and separation systems used on commercial launches. It also supplies the onboard computers for guidance and control systems for Ariane and Vega. Safran Aero Boosters – Safran Group – is one of the major actors in aerospace propulsion in Europe. The firm designs, develops and produces modules, equipment and test benches for aeronautics and space engines. Telespazio France – Leonardo and Thales Groups – has responsibility for the maintenance, operational exploitation and configuring of all the ground infrastructures on its customers’ sites. Its teams carry out these activities, which are at the very heart of all the Ariane, Soyuz and Vega launch campaigns at the CSG. World leader in terms of orders and European leader in the construction of satellites, the reason for Ariane’s existence and a key player in the field of orbital infrastructure. This firm is a European leader for the onboard electronics flown on Ariane, Soyuz and Vega, and also a global leader for electical power distribution and power conditioning for satellites. It supplies over 50% of the onboard electronics for Ariane 5 and produces the safety systems for Soyuz at the CSG.